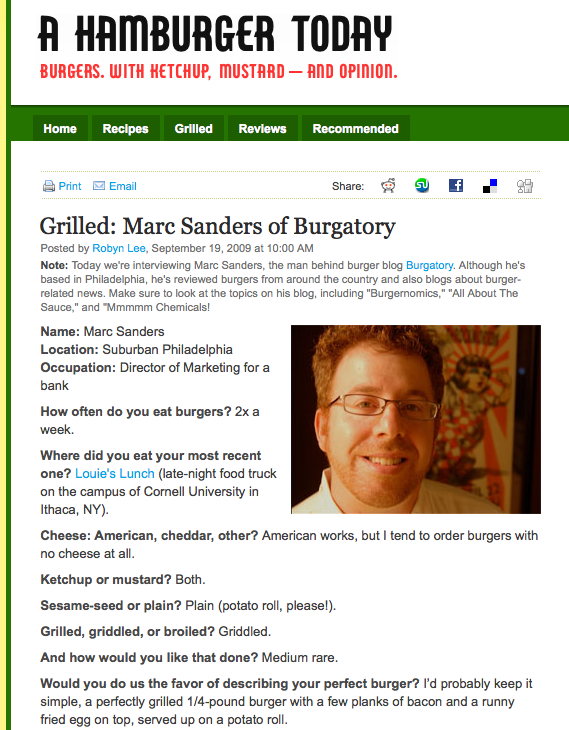 A few months back my brother-in-law began raving about a new burger joint that had opened out his way in West Chester. I have a lot of faith in his recommendations for other things so I was definitely looking forward to checking out Buddy’s Burgers, Breasts and Fries (double entendre intended?) as soon as we could and on a recent Saturday I finally got my chance as our families met up for lunch. I won’t be the first (or last) person to compare them to Five Guys, but I’ll say a comparison to them is only fair in menu configuration (little buddy = 1 patty, buddy = 2 patties) and in the offering of a myriad of toppings. 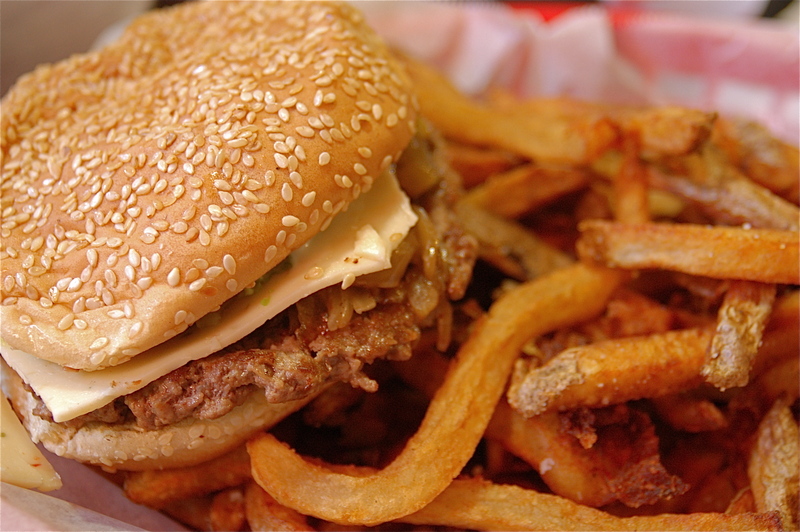 Anything further would be a slap in the face to Buddy’s as everything they do is superior to the ever growing chain – from the burgers to the fries. Their toppings menu is slightly more extensive than at Five Guys and opened up the opportunity for me to concoct a slightly Mexican themed burger to satisfy my spicy tooth. Pepper Jack cheese, avocados, jalapenos and caramelized onions worked perfectly on the more than generous griddle cooked single patty that I ordered. Served up on an over-sized sesame seed specked bun, the meat-to-toppings-to-bun ratio was perfect without going overboard (I can’t imagine having the second patty would add too much besides bulk – on me). The fresh cut fries are perfect, too. A small is more than enough for two people but you probably won’t want to share them. Huge flecks of salt set up camp on most of the fries giving you that great crunch when your teeth meet up with them. One of the interesting features of Buddy’s is that it is actually two restaurants in one, though both have separate entrances. The adjoining restaurant? The Salad Stop. You could see the tumbleweeds rolling down through the dining room while at the same time Buddy’s was bustling. It is an interesting combo that forces a pretty serious gut check as a look to the left towards the salads reveals perhaps how we should be eating, while a look to the right towards the burgers reveals how we really want to eat. My inner Michael Pollan was conflicted for about 2 seconds. West Chester is off the beaten path for Philly folks, but Buddy’s is worth the drive out one weekend. Two doors down is an Iron Hill outpost and a bunch of other top-notch watering holes line Gay Street. Baldwin’s Book Barn isn’t too far away and provides hours of entertainment searching for a rare book or quiet nook to read, and perhaps providing enough time to build up your hunger again to head back for another burger or a quick stop at West Chester’s legendary hot dog stand Jimmy John’s. Avocados as a free topping? That IS worth a trip to check out! Yes, avocados! The last frontier of free toppings. Pretty good, too. Real fresh, no brown spots at all. I love Buddies. Much better than Five Guys.